June was a month of cherries at our house. And fun fact: Cherries have been my favorite fruit since childhood. My mom used to buy me my own bag to eat all by myself every summer on our way to Camp Ne-o-Tez. (There was a farm stand on our way… Chico’s in DeSoto, MO. Anybody know it? Holla if you’ve been to Chico’s!) I’d store my precious loot in the camp’s walk-in fridge, and sneak back there periodically throughout the hot days to gobble up a few perfect, juicy cherries. (In between crawdad-catching sessions and pretending to be Pocahontas while canoeing in Crystal Falls. Picture me, age 9 or so, standing like a statue in the front of a canoe, drifting to and fro and singing “How HIIIIIIIGH can the sycamore grow! If you cut it down, then you’l neeeeever knoooooowwwww!”) I remember always wondering why everybody and their mama wasn’t as crazy about cherries as I was. Anybody out there want to solve that mystery for me? The process is super simple, and super worth it! You’ll need a few supplies you may not already have, but once you get them, you’ll use them for ages to come. 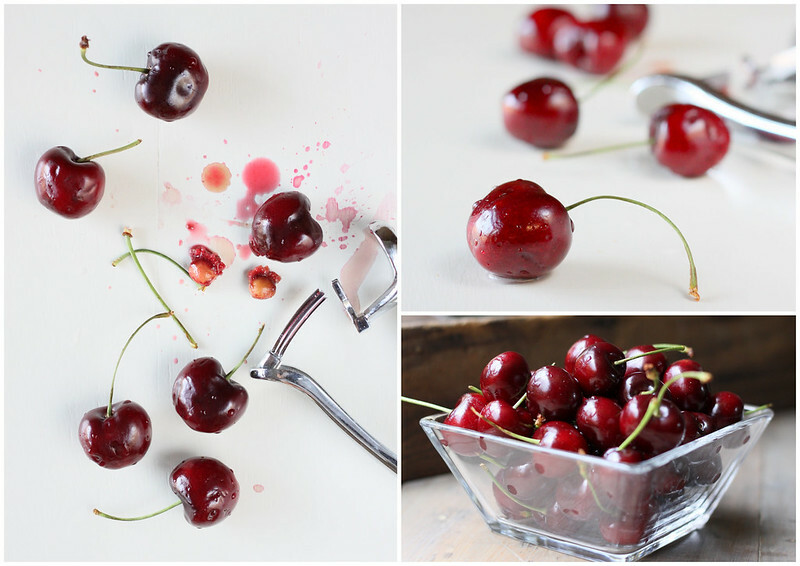 Once the cherries and the pickling liquid are in the jars, you can process them in a water bath so that they’ll keep for up to a year in the pantry. I highly recommend doing this. 1) Because it is fun and you will feel like Ma Ingalls. And 2) Because the cherries will last so much longer that way! You can even give them away as Christmas gifts. Just slap a cute label on there, a bow, and you have a one-of-a-kind homemade gift. Here is my tutorial for processing your canned goodies in a water bath. Easy peasy! And here is the recipe for these Pickled Cherries. When you make them, be sure to snap a pic and show it to me on Instagram so I can oooh and ahhh. 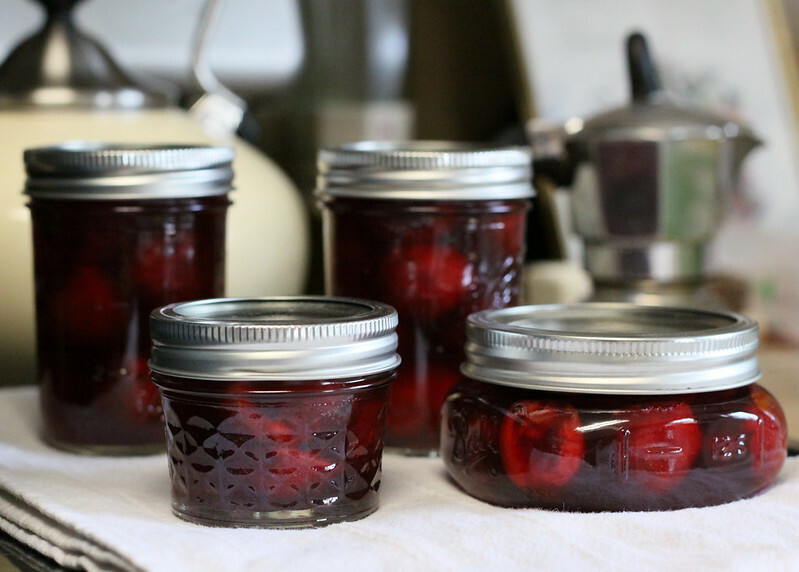 The perfect way to preserve the tangy-sweet bite of summer cherries, without all the cloying added sugar of jam. In a saucepan, combine sugar, salt, cloves, and water. Bring to a boil and simmer for about 5 minutes. Turn off the heat and allow to steep for 10 minutes. Stir in the vinegar. 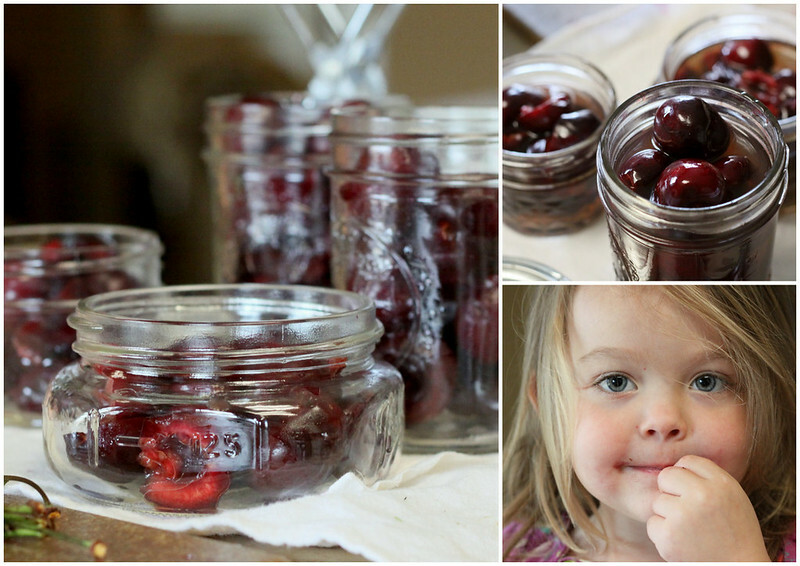 Place cherries into 4 sterilized half-pint jars. Ladle in enough liquid to cover the cherries, filling the jars and allowing about a ½ inch head space. Place lids on jars and screw on lid rings til you meet solid resistance, but do not over-tighten. Process in a water bath for 10 minutes, if desired. 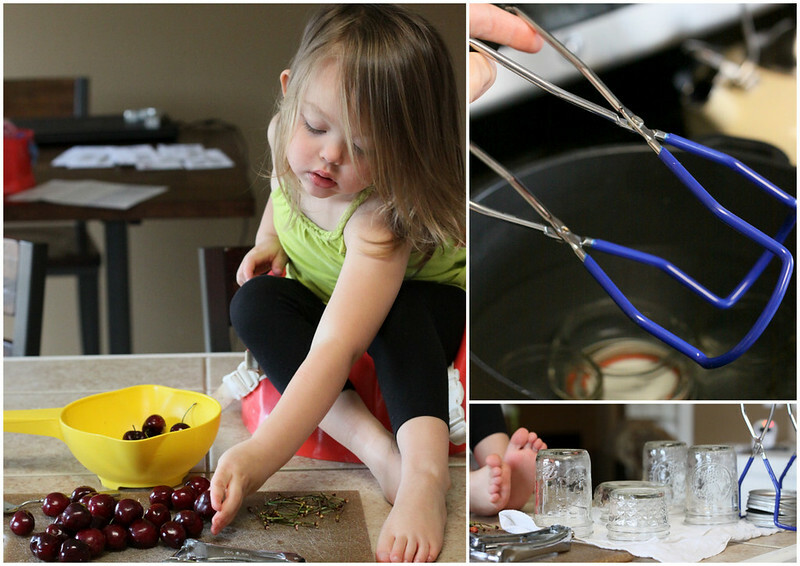 If you process in a water-bath, the cherries will keep for about a year. If you do not, they will keep in the refrigerator for up to 2 months.